Which Type of Dehumidifier Is Right for You? Savvy homeowners dread high humidity, not only because it causes discomfort, but also because over time, excess moisture can be severely damaging to the home. Often, dehumidifiers are the answer, but choosing the right model can be tricky business. Continue to get advice from an industry pro. Does this sound familiar? You step outside on a hot day, and though the weather may not be ideal, you can certainly tolerate it. The next day, however, the same heat combines with a higher level of humidity, and you’re left fantasizing about taking the next plane to a kinder climate. Though many people focus primarily on their own sticky discomfort, veteran homeowners know the darker side of humidity: When the moisture content of air rises above a safe threshold indoors, there can be a battery of negative consequences, from musty odors and mold growth to warped wood and cracked or peeling paint. In other words, your house hates humidity as much as you do! The solution? It’s simple—install a dehumidifier. Doing so not only boosts the efficiency and effectiveness of air conditioning, but also protects against damage due to excess moisture. The technology always works the same way, no matter if the dehumidifier is a portable model or a whole-home unit tied into the household HVAC. Air is pulled into the dehumidifier and exposed to a cold coil inside the unit, which causes water contained in the humid air to condense into liquid water that is then stored or drained. The now-dry air then exits the unit after passing over a warm coil. For all their fundamental similarities, however, dehumidifiers often differ dramatically in terms of capacity and design. 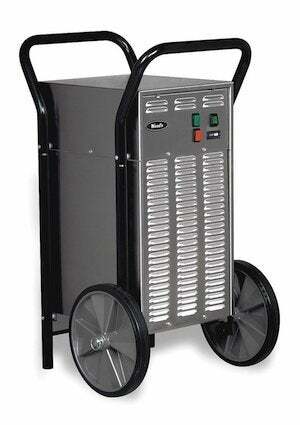 For a dehumidifier to serve its intended function, its capacity must match the demand. 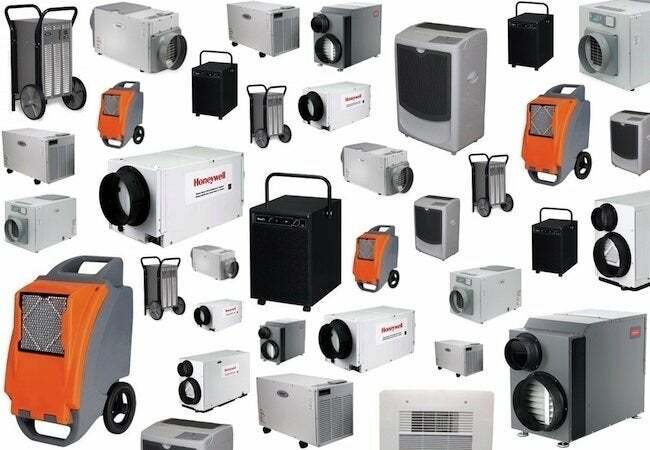 In other words, according to Daniel O’Brian, a technical specialist with SupplyHouse.com, “You need to make sure you get the right size dehumidifier for the job.” Much depends on two variables—the size of the space and the conditions within it. For instance, in a large, damp, closed-in basement, you would need a higher-capacity dehumidifier than in a relatively compact living space with sufficient airflow. If you’re considering whole-home dehumidification, it’s wise to consult with a contractor to make sure your unit will be compatible with your HVAC system and powerful enough for your needs. For portable units, however, you can generally rely on the coverage area specified by the manufacturer. 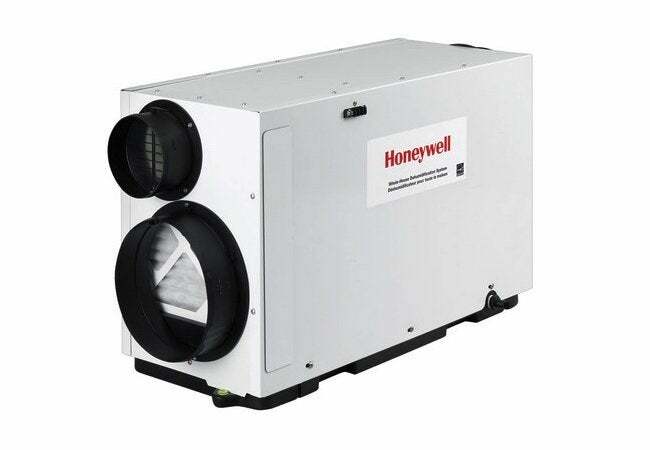 In terms of design, homeowners are probably most familiar with portable dehumidifiers that can be wheeled from one room to another in order to remove moisture from the immediately surrounding air. Such units are popular because they are user-friendly—as O’Brian puts it, “Installing one is as easy as installing a toaster.” They’re appealing also because these “plug and play” dehumidifiers tend to be the least expensive option, though not necessarily the least powerful. The downside: Portable units don’t run for very long on their own; many “need to be checked and emptied fairly regularly,” O’Brian notes. That said, in the wake of a moisture-related event—for instance, a flooded basement—O’Brian maintains that there’s no better option. Some homeowners are fortunate enough to face perilously high humidity only on occasion and in certain parts of the house. For others, though, it’s a persistent problem, and not just in one or a few rooms, but throughout the home. In the latter situation, “your best bet may be an in-line dehumidifier,” O’Brian says. Specially designed to integrate with the existing forced-air HVAC system, whole-home dehumidifiers are more sophisticated than their stand-alone cousins and for that reason usually cost more—”if only because their installation requires a pro,” O’Brian adds. Yet the added cost gets you at least a couple of virtues not found in portables. For one, whole-home units do their job behind the scenes, without ever becoming an eyesore. Plus, “set it and forget it” in-line units rarely require homeowner intervention.